NFL calls St.L., SD, Oak plans “inadequate,” but $2.66B Inglewood stadium somehow makes total sense? NFL commissioner Roger Goodell declared stadium proposals in St. Louis, San Diego, and Oakland to all be “unsatisfactory and inadequate” on Saturday, which is … exactly what you would expect the NFL commissioner to do in this situation, frankly. The guy is facing a vote of owners that needs 24 of 32 people in the room to agree on something, so this way all butts are covered, since any team they want to approve moving to L.A., now they can justify it on the grounds that its current city’s stadium offer was inadequate. Also, now all three cities are on notice that the NFL wants more money, dammit. This is Commissionership 101, and means absolutely squat in terms of who’s going to be approved to move to L.A. or not. Dallas Cowboys owner Jerry Jones submitted a formal resolution to the NFL that the San Diego Chargers be approved to share a stadium in Inglewood with the St. Louis Rams. Jones is an ally of Rams owner Stan Kroenke, so this is just a formalization of Kroenke’s gambit to offer to share his L.A. digs with the Chargers, something that Chargers owner Dean Spanos has so far rejected. It’s an official proposal now, though, for whatever that’s worth. The NFL plans to levy a 20% “flip back tax” on any sale of a portion of teams moving to Los Angeles. That could be pricey for the Chargers or Raiders if Disney CEO Robert Iger takes advantage of a clause in his deal to lend his name to those teams’ relocation efforts that lets him buy a share of one of those teams if he likes. San Diego is considering turning its current stadium site into a university campus if the Chargers leave, which, sure, all the kids are doing it. The upshot of all this is not much, and I’d still put my money on no decision being reached during the NFL meetings that take place tomorrow and Wednesday. Though one possible course of action has occurred to me: The league could approve, say, the Rams and Chargers to move to L.A. provisionally, on the condition that they negotiate a shared stadium deal that’s to both of their liking. That way the owners get to say they decided something, put pressure on Spanos and Kroenke to get a deal done, and keep the pressure on St. Louis and San Diego to up the ante in hopes of heading off losing their teams. It’s certainly what I’d do if I were a self-interested football billionaire, but whether 24 out of 32 people will think that way is anybody’s guess. Neil I think the St. Louis ship has sailed. At least wrt the Rams. The rams kinda nuked their relationship with the city. On another note, it never ceases to amaze me the level of arrogance and down right ignorance of the NFL. A city is will to provide $400 million dollars to build a stadium and Goodell has the balls to say it is inadequate. I really hope that we are seeing the end of cities building these rediculous stadiums. They add nothing beyond debt to cities. I’m still shaking my head at what goodell said this past weekend. I’m a football fan but really I hope that Mark Cuban is right when he said, referring to the NFL ‘hogs get slaughtered’. I hope the NFL bubble bursts. And soon!!!! Because the Coliseum is terrible for football. They would have to gut the entire stadium in order to center the field and if you do that, the endzone sightlines would be atrocious. It would also be very expensive. The parts of the stadium that are protected for historical purposes are the peristyle and the outer facade/berms outside the stadium. They could theoretically do a complete rebuild of the bowl, but it would be extremely expensive ($800 m – $1.5 b). USC is also in an awkward position where they are trying to make the seating better for football (unsuccessfully), but they also have to comply with potentially putting a track back in for the Olympics. Kroenke knows exactly what he’s doing (which is why he already got everything in order: land, city approval and is shovel ready) . The $2.6 billion stadium is part of the City of Champions Revitilization Initiative which is like the entertainment districts around the country, except this one would be in the entertainment capital of the world. When all is said and done, he’ll be raking in the cash. $2.66 billion is the price tag on the stadium alone, not the entertainment district. Even if he makes money on the entertainment district part, how can it possibly make sense to spend $3.2 billion on add ten football games a year to the mix? Neil: Is $2.66B the price tag for the stadium alone? You mentioned in the article that Kroenke might be adding in non-stadium costs? Possible it is the price for the whole development? Agree it makes no sense. As this goes along I’m starting to wonder if my original assumption that these guys were acting like they were nuts to squeeze their home cities might be not be right. They may actually be nuts. Growing up a RAIDERS fan, I can remember watching them on TV when they were in LA and two things always stood out. 1) the track. 2) the fan seated in the endzone where the USC retired numbers are located with the “John 3:16” sign. The Coliseum like Dave said would have to be gutted and the cost would equal a new stadium not to mention possibly losing its National Historial Landmark status. @Aqib…Because teams don’t want to either share revenue or be renters. They want to own/manage the facility (and get that facility at a deep discount thanks to subsidies from the city, county state, etc.). Dave: $2.6B is a heck of a price tag for a glorified mall. I mean the Burj Khalifa cost $1.5B to build and not only is it the tallest building in the world, it’s considered a giant folly and a monument to hubris’ triumph over all sensibility. Also, LA’s claim as “the entertainment capital of the world” would get plenty of heckles from other cities, but the fact you have lots of competition for entertainment dollars argues for worse returns, not better. If you want to build an “entertainment center”, the ideal is to choose a city with lots of people who have nothing to do because their hometown is grindingly dull. Houston or Phoenix perhaps? Pretty sure the NFL is playing its cards more carefully than we give it credit for. They said the offers (or lack thereof) on the table from St. Louis, Oakland, and San Diego are inadequate for retaining their teams. They didn’t say they weren’t good enough for a totally separate team via relocation or expansion. I never said that wasn’t the price of the stadium. I was just pointing out that the stadium is part of the City of Champions Revitilization Initiative. Which will have restaurants, retail shops, commercial business (including the NFL Network and NFL HQ), public park and residential space. It won’t be just 10 football games, we are talking about hosting all kinds of events here: NFL draft and combine, X-games, Soccer, NCAA football/basketball final four, Super Bowl etc. The main thing is no tax dollars or public funding will be used. Which is exactly what St. Louis, Oakland and San Diego are being asked to do. Kroenke was smart to have his ducks in a row ahead of time and now Spanos and Davis are screwed. Neither one has the money to build a stadium and the Carson project is a bunch of smoke and mirrors. It sits on a toxic waste dump and no one really knows how long and how much it will take to clean up. Meanwhile, Kroenke has the money and a shovel ready project which would open in 2019. If the NFL turns him down, I could easily see him go rouge and they really don’t want that to happen. Rogue is definitely the most entertaining for us, but has to be very un-entertaining for everyone else, assuming they want to do LA right this time. Lack of ability to make a decision is bad enough. But suing to keep a team out of LA who wants to spend its own money on a new stadium is a tough story to sell. The larger Inglewood complex may or may not make financial sense — I haven’t looked at the financial details, and am really not qualified to make a determination regardless. But the question is how on earth an NFL stadium makes the larger complex $3.3 billion more valuable? If it’d be a great place for housing and restaurants the 355 days a year the Rams wouldn’t be there, why not just skip the stadium and save $3.3 billion? As I’ve said a million times, it’s Kroenke’s money, so no skin off my nose. (Though as I’ve also pointed out a million times, it’s not *entirely* Kroenke’s money, since he’d be getting some sales tax kickbacks, albeit not much compared to that crazy price tag.) But I do remain puzzled exactly what he’s up to here. We really seem to be at an interesting point in the NFL–that even the foolish offers are unworthy and nobody seems particularly worried about “losing” their team. At least not worried enough to seriously change the offer. The juxtaposition between building supposedly the world’s greatest entertainment center and undercutting its impact with a pointless football stadium couldn’t be more stark. One would think every square foot would be valuable. The other option is that NFL owners, fed a steady diet of how popular/important/brilliant they are in the sycophantic NFL-owned or NFL-operated press, really do believe that they have discovered an investment that only goes up. That’s usually when the bubble forms. The issue here is Kroenke has been betrayed by St. Louis and cannot go back. Their proposal is horrible and it is because of the history. In the original 1995 lease, St. Louis (RSA) promised to keep the dome up to top 10 in the league. Not once have they come through on that promise. In fact, over 12 years of back and forth the RSA wanted the Rams to foot half the bill. When the Rams took them to arbitration and won handily the RSA backed off and sat around doing nothing. It was only when Kroenke assembled the land in Inglewood they got off their asses. Now they are proposing a new open air stadium where the Rams would have 20 times the operating costs. Right now the RSA per the original lease picks up most of it as they agreed to. Therefore Kroenke is not taking no for an answer. He is going to LA hands down or he will block Carson as he does have the votes to do so tooth and nail. Spanos is a master politician and has 20 votes only because he has other owners who owe him favors. Not because of his proposal being superior, the finance committee and relocation committee have to now formally show why Carson is better than Inglewood, they cannot as it is not even close for the reasons David explained above. As for the price tag? A drop in the ocean for Kroenke, who can do this by himself and not need much financing. The Carson project would require large loans and with 2 teams cannibalizing each other for sales it could get ugly. The franchise value increase alone will make up some of the $$ Kroenke is throwing into the mix. Rams are worth 1.45B in St. Louis in LA that # skyrockets to 3B. LA Rams in 2016, LA Chargers will be too if Dean Spanos gets wise and jumps in with Kroenke while the getting is good and ditches that spoiled rich kid Mark Davis who is riding his coattails. Number of NFL teams worth $3B, per Forbes: two, the Cowboys and the Patriots. L.A. may be a nice market and all, but I really don’t think the Rams become more valuable than the Giants or 49ers just by playing home games there. And even if they do, that would then mean Kroenke would be spending $3.3B to get back $1.55B. I know the joke about how the way to make a small fortune in sports is to start with a large fortune, but I don’t think that’s what they had in mind. I mean, seriously, does anyone buy your underlying thesis that Kroenke is being squeezed as a team owner in St. Louis? And what gives you special knowledge of what Mark Davis is like? The guy is a lousy owner. He may be rich, but his teams don’t win anything, no matter what the financial situation. Rams have been “betrayed” by the city of St. Louis? No, that is not accurate. It could well be fair to say that the city is in breach of it’s (ridiculous) contract with the team, I’ll concede. What I’m not clear on is why, in that case, Kroenke wouldn’t simply take them to court FOR breach of contract, as any other business owner would. If there’s one thing we’ve learned from this whole “escape to LA” thing is that Kroenke wants to be in LA regardless of relative financial picture in St. Louis. Any of us can easily look at the Stl offer and determine that with $477m on the table in St. Louis for a stadium he will be significantly better off than in LA financially (at very least on the stadium side). LA is certainly a bigger market, but at most he’s going to benefit from that in terms of larger attendance (but not much larger, given that there is a practical maximum to football stadium capacity). As I recall merchandise sales is mainly shared revenue, so it’s not like he can print up 8 million LA Rams hoodies and keep all the revenue himself. Ditto TV revenue… there’s presently no real “regional” NFL tv revenue earning potential, and as near as I can tell there can’t be until the end of the present tv contracts. With the NFL network still stumbling along, I’m not sure there is an opportunity for a “Rams themed” channel on an RSN in LA either. The one thing that we do know about this is that he just wants out of St. Louis and in to LA. We will probably all find out within a few years what he saw coming that we didn’t… (maybe he wants to be the new Ueberroth and bring another Olympics to town…) but for the moment, there is no obvious reason beyond his desire to own an LA NFL team (and ent district) and his desire no longer to own a STL NFL team. As Neil has pointed out, it’s easy to see how he might make money on the entertainment district. 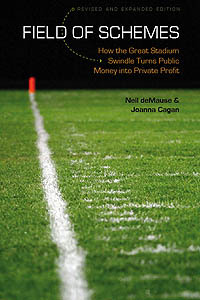 It’s less clear how the NFL stadium can be profitable when privately financed. Kroenke didn’t sue St. Louis for breach of contract because the lease provided a penalty for not keeping up with the state-of-the-art clause: The Rams could opt out of the lease. Which they did. So nobody’s in violation of anything. A drop in the ocean. We’re now talking about $3.3B. Stan Kroenke’s net worth is $6.3B. Stan Kroenke is a very rich man. However, let’s not get carried away. We’re not talking about Bill Gates or Warren Buffett here. The Raiders are coming to L.A., we need are meeting place back, Ice Chest will sing the anthem. I realize that there is a lot of sentiment for Inglewood among NFL owners but it’s certainly not the slam-dunk everybody thinks it is. And now we’re talking a stadium that’s not even going to be ready until 2019–and probably longer, knowing how these projects go. The first thing to keep in mind is that there’s no appeal for large mega-projects in Los Angeles. If anybody thinks that businesses and shoppers will automatically flock to this “new” Inglewood location, think again. In 1978, developers proposed a large scale project called Playa Vista on the much more desirable westside of L-A. Years of lawsuits later, it broke ground in 2002 and the work is still going on today to bring in more tech-companies. To think that business owners and crowds of shoppers will somehow flock to Inglewood-which is in a much less desirable area that lacks easy freeway access is crazy. Throw in the fact that some owners may not want to pay rent to the Rams for NFL studio space and the FAA has raised concerns about the project and there are enough red flags to start a semaphore marching band. And that raises another question- if a consensus is building for the Rams and Chargers in 2019, what harm would it do to conditionally approve the Chargers move based on the outcome of a public vote in San Diego in June or November? The new stadium would still supposedly be available in three years. Of course we know the answer, don’t we. Well would you look at that…..Spanos is finally coming to his senses. But: Is anyone really certain that Spanos would be better off as a tenant in Kroenke’s stadium and sharing some percentage of “LA” than he would be in San Diego? No-one can dispute that LA is a huge market, but I’d rather have a smaller kingdom that I owned than share a big one – especially as very much the junior partner in the big Kingdom. Neil: Yes, I understand that he has opted out. However, that wasn’t his only option. He could also have sued for breach once it became clear they weren’t (in his mind) keeping the stadium “in the top ten” or whatever the actual clause required. It’s still a breach if he demonstrates that they aren’t doing what they (foolishly) said they would. I don’t believe the contract included early termination as his sole available remedy did it? The key there is the “junior partner” part. In my opinion, if the Chargers end up in LA with either the Rams or the Raiders, they will play second fiddle in terms of fan base. And that’s without accounting for whoever they lose back in the San Diego market. Chuck: Are there wetlands in Inglewood, because how much of Ballona that development was going to be allowed to pave over was the source of some of those lawsuits. Can’t imagine such hurdles exits is Kroenke is going to pave over pavement. Also, that corridor has been totally transformed over the last 10 years. Not saying that’s for the good or for the bad. But it’s not the best analog for the NFL moving to LA or LA’s appetite for large scale developments in general. I believe early termination was the sole remedy, yes. And as for Spanos coming to his senses, the only sources in that article are other owners, and we don’t know if they’re Kroenke allies. It’s possible the tide is starting to turn in favor of forcing Spanos to accept a share in Inglewood, but we don’t know whether he’ll accept it, or on what terms. It’s just come to a point for me that I’m really looking forward to this league going out of business. The rate of participation in high schools is falling radically. People are waking up. Cities: You don’t need the impending mess the NFL is about to produce. I give it 10 years. I used to be a fan; now I regret all the weekends I wasted on this sport. Well, I’m not 100% certain the sun will come up tomorrow morning. However, a reasonable proxy I supposed is the potential of the market. The LA-Long Beach-Anaheim MSA has a GDP of $867B. The San Diego-Carlsbad MSA has a GDP of $206B. All else being equal, as a rough cut if you can capture a quarter of the LA market, you should come out ahead. Now of course all else may not be equal. For all we really know everyone in LA hates football, hates the Chargers and Kroenke wants rent of $200M a year. So we don’t know, but if the market dynamics were similar and the rent costs the same in the two cities, in theory you could be second fiddle in LA and do fine. For what it’s worth, the St Louis MSA is GDP is $150B. The SF-Oakland-Hayward MSA GDP is $411B. Yes, the 49ers are also there but their stadium is technically in the San Jose-Sunnyvale-Santa Clara MSA with its $214B GDP. Now of course there’s the extra wrinkle that most revenue in the NFL isn’t local in nature. However, this is more general “where would you put a sports team.” Hence, why the Clippers who are second fiddle if any team has ever been second fiddle don’t move back to San Diego. This whole process has been a mess ! Should be an interesting couple of days. I look forward to at least one of these owners crawling back to their current cities. GDP is a pretty terrible proxy for sports revenue potential, at least until they figure a way to build a stadium with 2 million seats. I’ve read several of the articles related to NFL LA relocation on this site and many comments. But, what I haven’t read is any consideration as to the operational concerns. Moving the Rams closer to other teams in the NFC West makes sense for long term and almost appears as it was considered in the realignment several years ago. The prospect of the Raiders and Chargers, both in the AFC West, moving to the same city makes absolutely no sense. I think the late entry by both owners entering in the relocation lottery on the same proposal is a money grab. Both hoping the league will buy their silence. My money is on the Rams and only the Rams only going to LA. With the “losers” getting fat checks. Neil: I don’t claim it’s a great proxy, but for the opposite reason. When you are trying to determine the impact of seat sales, suites sales to corporate sponsors, naming rights, advertising and sponsorships, TV sets and the ads that brings, etc. etc. etc. you need a pretty broad measure. Not everyone can afford a luxury box but they might buy a can of Bud Light with a lightening bolt on it. Neil, sure they will. Doesn’t intone the other 30 owners want to realign again. I think that would take league wide agreement on a much more contentious issue. Granted who fears the Chargers or Rams, but the Raiders could be another issue. simple relocation to LA of a single team benefits the entire profit sharing concept. Scola: Is L.A. a better market than S.D.? Totally. Is a team in L.A. four times as profitable as one in S.D. because it’s four times the GDP? Almost certainly not. The real answer is somewhere between 4x and 1x, but that kind of error bar doesn’t really help us much. BigBadB: There are a lot of factors that are going to go into consideration in this decision, but I feel comfortable in saying that what divisions which teams are going to play in isn’t even in the top ten. An additional thought.. in the long term which division will draw fans to the home games? AFC with Manning and Rivers nearing retirement and Reid and the Chiefs effective but far less than flashy style. Or the NFC with Carroll/Seahawks and Arians/Cardinals and their more entertaining offensive units coming in. Neil: For the NFL, as most revenue is shared and thus based on the US economy, not the local economy, it really isn’t worth much more. However, we do have one sport where most revenue is local and where both LA and San Diego have teams. Per Forbes the Dodgers are worth $2.4B, the Angels $1.3B and the Padres $890M. The ratio in GDPs is 4.2X. The ratio in MLB team values is 4.15X. The issue is with the NFL a 4X increase in local revenue isn’t nearly as big of a deal as with MLB, the NBA, etc. Looks to me like all of this is job security for Neil. While LA may have 4x the GDP but it also has 6 other major league pro-teams, 2 powerhouse college football programs and 1 iconic college basketball programs. So while the pie maybe bigger there are more cuts being taken out of it. That seems an odd way to model things. The bigger issue by far is the peculiar economics of NFL revenue sharing. Most revenues a new LA team might generate will be shared by all NFL teams equally. The market is lucrative but the owner pays all the cost and gets 1/32 of the benefits. The economics work in most sports, but not the NFL. Santa Claran…What’s your beef with Neil? One would think that being from Santa Clara you might be aligned with his criticisms since the people there got steamrolled by the Niners-in-their-backpockets-politicos. The stadium was one of the reasons I bolted. I can’t see any good it has brought the city except headaches and broken promises for its citizens. I took it as a joke, that I’m going to be assured of getting to write about this stuff long into my dotage. I just hope you all want to keep paying for lots of buttons. Problem is your “long term” is still probably less than a decade. Pete Carroll and Bruce Arians are both over 60 so they won’t be coaching forever. (Andy Reid is also over 60 so who is to say the Chiefs won’t have some great offensive mastermind in a couple years?) In the capped NFL teams don’t tend to stay great for all that long. If this were baseball and it was a shot at the Yankees being in the division then it’s a different conversation, but fortunes in the NFL change rapidly. In 1969 when baseball first split into divisions, the NL put the Cubs in the East because they didn’t want to deny the other East teams a chance at playing such a powerhouse that would be sure to draw fans. Kneel DeMouth is a bitter Dodgers fan and Lakers fan, he has a site that produces nothing but rumors, he will be moving to Vegas with the rest of his So Cal buddies. I’ve been accused of a lot of things in my day, but being a Lakers fan is not one of them. @ JC – I have no beef with Neil. I enjoy reading this website. I was just pointing out that the more infighting there is for LA stadiums and team relocations, the more articles Neil can write. And yes, I am completely aware of what went on here in Santa Clara with the stadium ballot measure, and unfortunately what is still going on with our City Council majority still firmly in the pocket of Jed York and the NFL (just look at what’s going on with the youth soccer park next door to the stadium and how the youth soccer league was blindsided by our city council – the soccer park has sustained a lot of damage to create a media village for the super bowl- see San Jose Mercury News for articles on that.) All of the predictions of costs to taxpayers (especially public safety costs), ownership of our city council by an outside wealthy entity, loss of use of numerous public facilities, traffic and parking nightmares) have all come true. So communities willing to build new stadiums should be careful what they wish for and be careful who and what they vote for.